Although most hair loss problems are caused by the same few conditions, there are rarer conditions out there. Sufferers of these are often misdiagnosed as having a more common problem, which can lead to ineffective or pointless treatments. Hypotrichosis simplex affects just a small number of people but extensive research into how it works could improve understanding of other hair loss conditions as well. Hypotrichosis simplex usually develops in early childhood, with most sufferers losing a substantial amount of hair before they are 10 years old. There are two forms of the condition: one affects only the hair on the scalp, while the other can also affect body hair and has been linked to problems with fragile fingernails. 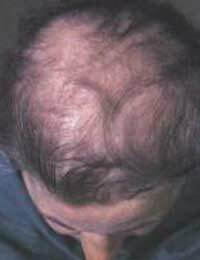 In cases of hypotrichosis simplex, hair loss takes a similar form to that seen in ordinary Male Pattern Baldness, in that follicles are damaged so they can no longer produce healthy hairs. Instead, they produce thin, fine hairs like those on a newborn baby. By the age of 30, most people with this condition will have no noticeable hair left. Hypotrichosis simplex is known to be caused by a mutation in a particular gene. Often it Runs In Families, usually being passed down the male line, but it can also occur spontaneously. This mutation interferes with the body's signalling mechanisms, sending a message to follicles that tells them they are no longer needed. If you suspect that hypotrichosis simplex may run in your family, your doctor can help you to work out the odds of your children being affected by the condition. Even if you are not affected by it, but are a carrier, the gene could increase your risk of developing Alopecia Areata later in life. There is at present no cure for hypotrichosis simplex. Because standard hair rejuvenation drugs can have dangerous side effects in children and teenagers, it is important to resist the temptation to try them. The long term development of the condition means that they would have no lasting effect anyway. Work is currently underway on gene therapy treatments to halt this condition. Because they would involve the repair of the gene to a known standard, these should be relatively safe and side-effect free, making them a practical option even for use in children. Unfortunately, treatments to replace lost hair will probably take longer to develop. Because it causes problems so early in life, hypotrichosis simplex can be especially difficult to cope with. It's important to provide affected children with plenty of support and give them as much control as possible over how they choose to present themselves. Talking to teachers can help prevent problems at school, and it's important to explain that your child is not infectious and does not have cancer. Like other conditions that run in families, hypotrichosis simplex can lead to parents blaming themselves, which rarely creates a positive environment for an affected child. Family counselling is often a good idea, alongside medical support. Sufferers need to be careful about looking after their nails and skin in case related problems develop there. Hair loss can be difficult for adults to deal with let alone children. Find out how you can help and support your child in our article How To Handle Hair Loss In Children.